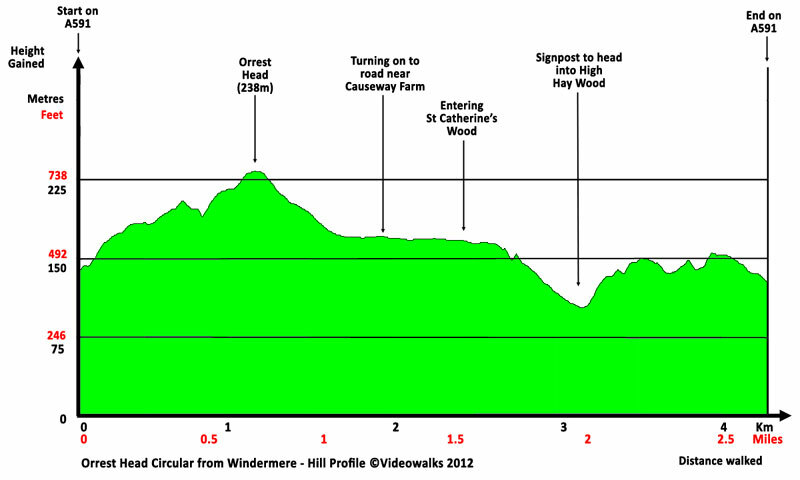 A short circular from Windermere to Orrest Head, which was Wainwright's introduction to the Lake District. On a clear day, the ratio of views to effort put in probably cannot be beaten. The walk starts on the A591 by the large 'Orrest Head' sign and follows a lane most of the way on its 20 minute journey to the summit. From the summit, you could just return back down to the start, but the walk as described heads north to join a lane briefly near Causeway Farm. It then heads to enter a delightful woodland section through St Catherine's Wood and then via High Hay Wood back to the start. 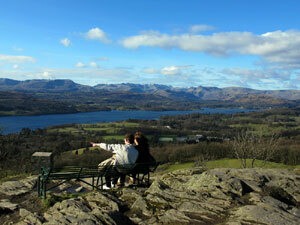 Wainwright said of Orrest "Orrest Head for many of us, is 'where we came in' - our first ascent in Lakeland, our first sight of mountains in tumultuous array across glittering waters, our awakening to beauty. It is a popular walk, deservedly, for here the promised land is seen in all its glory. It is a fitting finale, too, to a life made happy be fellwandering. Dare we hope there will be another Orrest Head over the threshold of the next heaven?" Parking: Small amount of roadside parking in laybys near to the start (grid reference SD 412 987). The added bonus - time limit in laybys applies. There is a lot of parking nearby in Windermere, then just walk back up the road to the start of the walk at the junction of the A591 and A5074, just opposite the entrance to the station.